NEW YORK • After he finished working on the final season of his critically acclaimed drama Mad Men, Matthew Weiner found himself suddenly, alarmingly, unable to write. "I didn't know what I was going to do next and I was getting asked all the time," he said. "I was worried I was not going to be able to write again." Finally, in the summer of 2015, Weiner called his friend, novelist A.M. Homes, for advice. She suggested he seclude himself at Yaddo, the artists' colony in upstate New York. A few months later - with some terror, he said - he followed her advice. While there, he began writing an unsettling psychological thriller about a wealthy New York family whose lives intersect with a sociopathic construction worker. The resulting book, Heather, The Totality, is slim, at just 138 pages. But it has become one of the most anticipated literary debuts of the season, with a parade of endorsements from prominent novelists, including Zadie Smith, James Ellroy, Claire Messud, Philip Pullman and Michael Chabon, who described the novel in a blurb as a mashup of "Flaubert and Richard Yates, with a deeply twisted twist of Muriel Spark at her darkest". 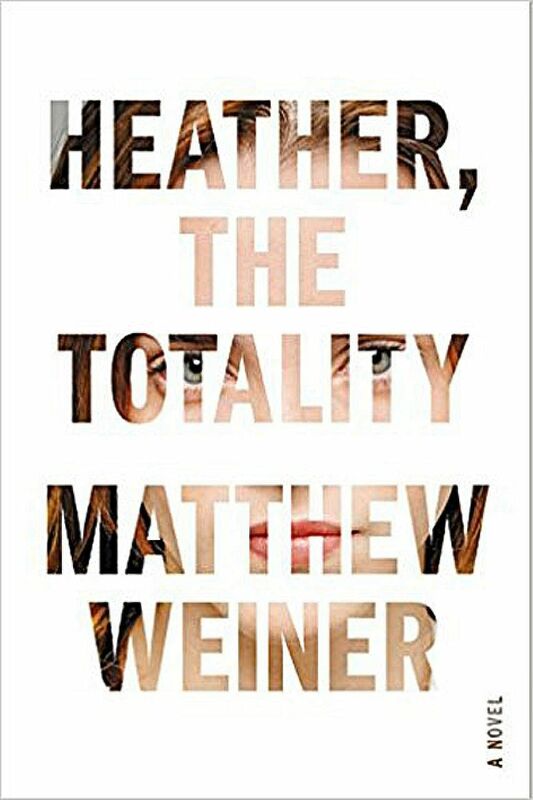 Matthew Weiner has written Heather, The Totality (above), a psychological thriller about a New York family whose lives intersect with a sociopathic construction worker. In a screenwriting career that spans more than 20 years, he has been a creative force behind some of our era's most revered cable dramas, shows that were credited with reinventing the narrative possibilities of television. He received two Emmys for The Sopranos, which he worked on as a writer and producer, and was the creator, showrunner, head writer, director and executive producer for Mad Men, which aired for seven seasons and won four Golden Globes and 15 Emmys. Weiner's foray into fiction surprised a lot of Hollywood observers. "Everyone was breaking down his door to do another show and he goes off and does something that no one was expecting," said Semi Chellas, a writer who worked on Mad Men. "The contrariness of going off and writing fiction after Mad Men was very Matt." Heather unfolds in present-day Manhattan and like so many gripping New York stories, the plot hinges on real estate. The couple at the centre of the story, Mark and Karen Breakstone, lead sheltered, privileged lives and fawn over their perfect daughter, Heather. Mark, who works in finance, frets about his annual bonus and his status, while Karen stays home to tend to Heather, then becomes resentful when Heather grows up and no longer needs her. The Breakstones' quiet, simmering dissatisfaction is interwoven with a darker, parallel story about a man named Bobby Klasky, who grew up neglected by his heroinaddict mother and developed a violent streak. The two narratives collide when Bobby finds work on a construction crew that is renovating the penthouse in the Breakstones' building and becomes obsessed with Heather. Weiner is now back to writing and producing TV - he is currently working on his new show, The Romanoffs, an anthology series for Amazon that follows people who believe themselves to be descendants of the Russian imperial Romanov family.